Like the Shimano XTR, Formula’s R1 Racing comes as a bled lever, hose and caliper; you then buy a hardware kit, which is available with adapters, bolts and a stainless steel or two-piece rotor. 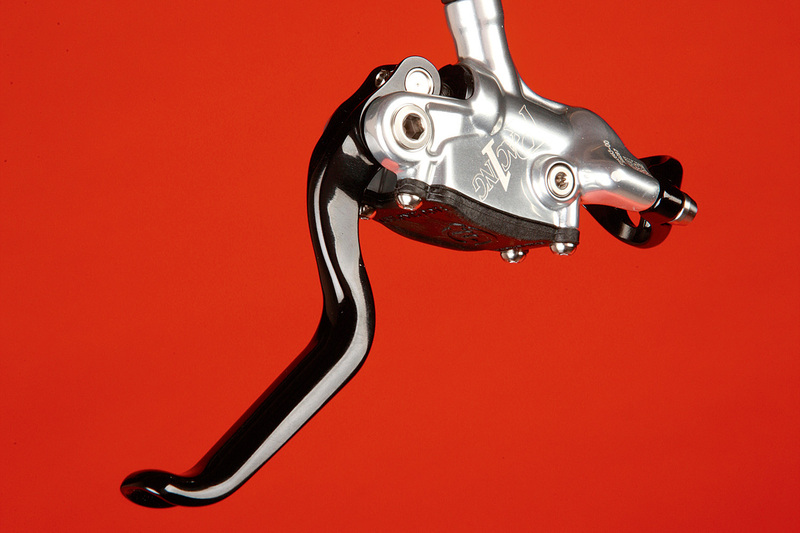 The lever gets a removable handlebar clamp, with the same gapless-style clamp as found on Avid brakes, but we struggled to get the shifter into a position where we could brake and change gear at the same time. This is because the reservoir butts right up against the handlebar, limiting space around the clamp. The solution may be to buy Formula’s Mix Master clamps — at an extra £31! The forged caliper features ECT (Enhanced Caliper Technology) mounting hardware, a bevelled washer system also used by SRAM and Shimano. It’s open at the top and bottom for better cooling, and the pads get a semi-metallic compound with lightweight aluminium backing plates. Bed-in time was minimal, but the same can’t be said of set-up — the R1 rotor rubbed constantly. With its oversized pistons and Kevlar hose, the Formula R1 Racing is the most powerful brake here. It’s also the lightest, but the stumpy lever is a little uncomfortable when braking hard; it also needs constant fiddling to run drag-free.